In the last few years I’ve read and participated a lot in positive mental health reading and workshops and one of the best benefits I’ve found so affirmations. Whether towards myself to towards others, being grateful was a great lesson to learn. I started small and became grateful for a good cup of tea, a cool breeze when it was warm, fluffy socks. It then got bigger and I became more appreciating of what I had. With my best friend we send each other a lot of positive messages and support each other so much. I’m incredibly luckily to have her. To show my love to my friends and family I set out to make an affirmation advent calendar. For my best friend I made it in the shapes of fairy light bulbs, each one a different colour, numbered from 1-25. On each one I wrote either a positive message, quote or just a loving memory I have of her. I packaged it up and included a ribbon for her to hang the light bulbs on and gold paper clips to look like the filaments in the lamps. I drew the light bulb shape and then cut them out using the first as a stencil, I did the same for the holly leaves too. There are many different shapes to use. I also made gingerbread men, stockings and Christmas tree shapes before I settled on the light bulbs and holly leaves. There are so many beautiful quotes available but this is one of my favourite from C.S Lewis. 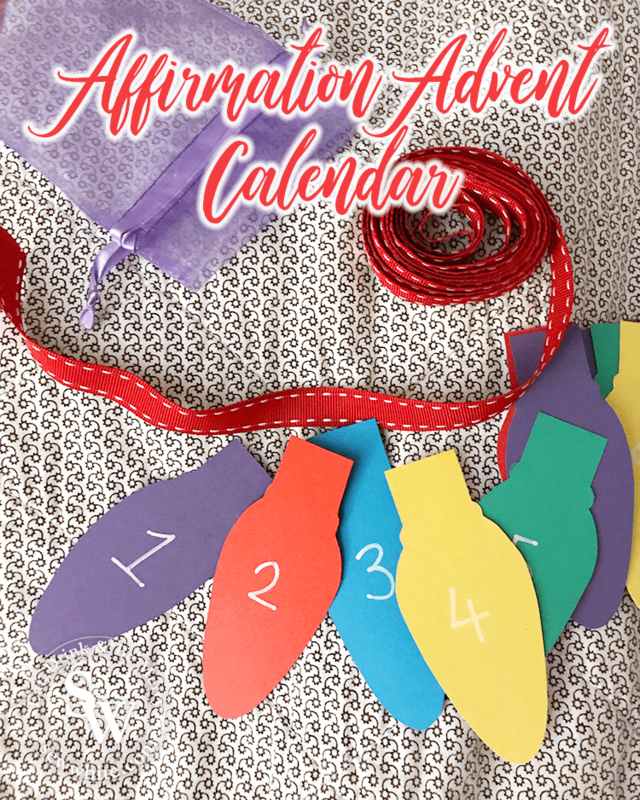 See below for my favourite affirmations and quotes that you can include in your own affirmation advent calendar. As well as the cute light bulbs I made a holly leaf advent calendar for the boyfriend and displayed it rather beautifully I think with red pompom trim to act as the berries. It’s hung up over the bed and it looks so cute. Each day he is planning to turn the affirmation around and read it. I’m amazed that no peaking has gone on. I bought the little pegs from WH Smiths and the pompom garland was left over from a project but is available in so many craft and fabric shops. It felt rather daunting writing so many affirmations in one go so I’ve written a few of the ones I used below to give you starting point. Here is a mixture of affirmations, quotes and a little bit of silliness that I have written on my affirmation advent calendars this year. Of course a few Disney quotes and geeky movie quotes ended up in there too.